One of my favorite things about spring (besides it is warmer) is the fresh produce that comes with it! Delicious fruits and vegetables become available adding that delicious taste to any easy healthy recipe you prepare. Asparagus is one of my favorite spring vegetable! Tasty, crunchy and easily cooked! I roast it in the oven with olive oil or boil it with a pinch of salt and butter! I never tried them in a salad though! During my last trip to the grocery store: IGA, I was inspired by their Inspried magazine: Taste of Spring! It had mouthwatering easy healthy recipes for spring ! 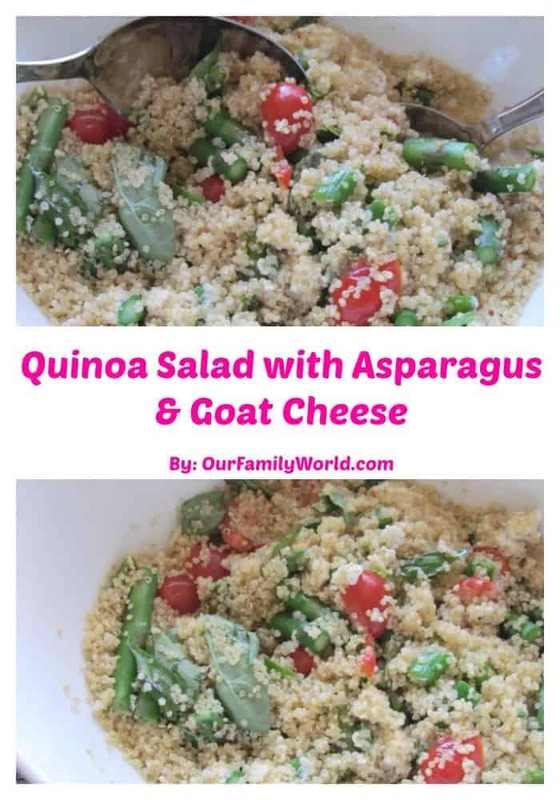 The Asparagus, Tomato and Goat cheese Quinoa salad caught my eye! I have never prepared Quinoa before! I was curious to try it and see how it tastes! 1/4 cup of extra virgin oil. Cook the Quinoa as the directions! I was a bit nervous because Quinoa is the main ingredient and I was afraid I over cook or not cook enough. Everything went well. Boil the Asparagus for 1 minute. To stop the cooking, transfer them in a bowl of cold water for few minutes then chop. Dressing: in a large bowl, mix the vinegar, olive oil, salt and pepper! 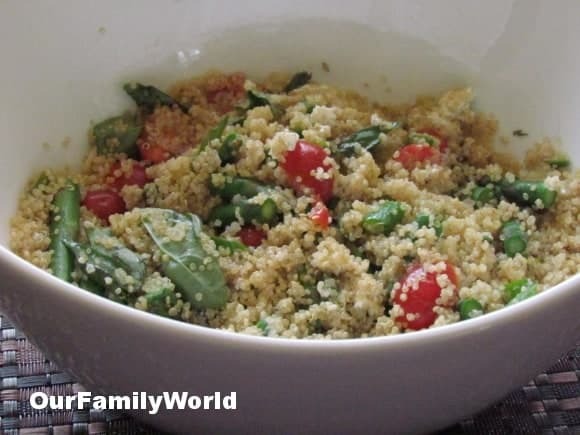 My husband and I loved this Quinoa salad! We had it with a salmon steak! The Quinoa tasted a bit like couscous! The mix of Asparagus and Goat cheese was perfect: crunch and soft at the same time! My husband isn’t fan of goat cheese but he enjoyed it in the salad. Next time I would reduce the quantity of cherry tomatoes! I prefer it with less! The tomatoes I had were too ripe! We ate the salad as soon as it was ready! (It took me 30 minutes to prepare). There was some leftover that I served the next day. I didn’t enjoy it as much as the first day! My husband did though! Maybe because I like the couscous and all the pasta warm! Did you have Quinoa before? How did you prepare it? Share with us your easy healthy recipe idea. I would love to hear from you! I used one tablespoon, Darla – let me know how you like it! I really want to try that! I’ve been meaning to cook more with Quinoa, but just haven’t had the recipes to give variety! 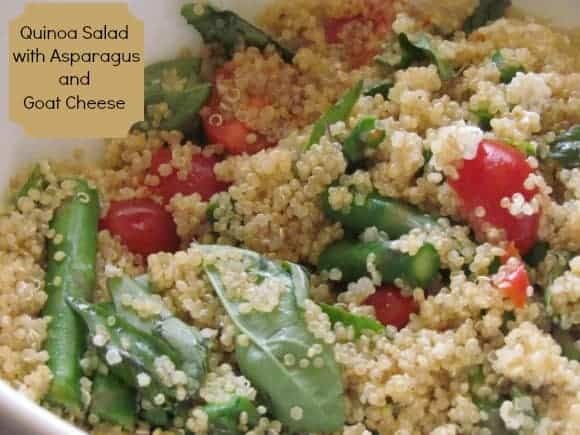 There are so many people coming up with some fabulous recipes with it and with the health benefits, I plan on creating more delicious recipes with Quinoa! I’ve never tried Quinoa but this looks like a delicious way to enjoy it!